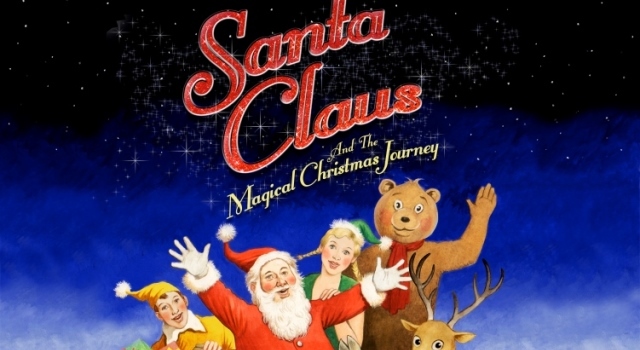 "Plenty of magical moments to captivate children as young as two"
It’s Christmas Eve, and Santa Claus is flying high above the clouds delivering presents to all the good boys and girls around the world. Hiding in the back are two naughty elves Charlie and Kara who have snuck on-board for the ride…! All is well until suddenly the Sat Nav goes haywire and breaks leaving him stranded without his list of postcodes to deliver presents to! With the clock ticking and morning fast approaching it’s down to Charlie, Kara and Muffin the bear to come up with a clever plan to save Christmas. From the producers of last year’s record breaking production, this brand new adventure filled with songs, nursery rhymes and magic promises to be the Christmas treat you won’t want to miss. A truly unforgettable experience which includes the magical moment when snowflakes fall over the audience – a guaranteed white Christmas at every show! As an added Christmas treat, all of the good boys and girls in the audience will meet Santa after the show and receive a special present of their own. WITH SONGS, STORIES, A MEET AND GREET WITH SANTA & A FREE GIFT! It’s Christmas Eve, and Santa Claus is flying high above the clouds delivering presents to all the good boys and girls around the world. Hiding in the back are two naughty elves Charlie and Kara who have snuck on-board for the ride…! All is well until suddenly the Sat Nav goes haywire and breaks leaving him stranded without his list of postcodes to deliver presents to! With the clock ticking and morning fast approaching it’s down to Charlie, Kara and Muffin the bear to come up with a clever plan to save Christmas. From the producers of last year’s record breaking production, this brand new adventure filled with songs, nursery rhymes and magic promises to be the Christmas treat you won’t want to miss. A truly unforgettable experience which includes the magical moment when snowflakes fall over the audience – a guaranteed white Christmas at every show! As an added Christmas treat, all of the good boys and girls in the audience will meet Santa after the show and receive a special present of their own. "Full of festive singing, seasonal costumes and merry cheer"
"It is an ideal first introduction to theatre"
"The production is overflowing with Christmas cheer"